By Tanel, January 15, 2008 in Plugins - Publishing ONLY! This plugin extracts a color range from image, by leaving pixels of selected color opaque and making the rest transparent. Only alpha values are altered, color remains intact. It is useful if you need to edit certain colors on your image separately: duplicate the image layer and run the plugin to get color-based "selection" for further editing. It is more flexible than Magic Wand or Curves+ which could provide similar results but not always exactly as needed. Menu location: Effects > Photo. Download as part of my plugin pack. Updated to version 2.2 (2008-12-24)! Changes: few UI and code optimizations; moved to Color submenu. Updated to version 2.1 (2008-08-31)! and three adjustment controls (on bottom) to adjust the output. For ease of use, the default color range is defined around primary color. So I suggest to use color picker tool before starting the plugin. Check box near each color control defines whether you restrict color by this parameter or not. Unchecking equals to selecting the full range. 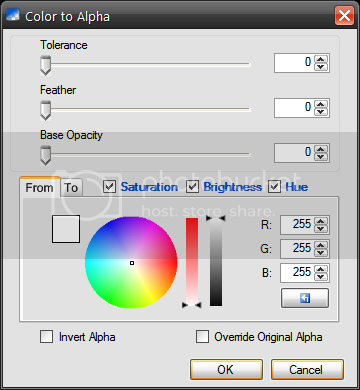 Tolerance control makes alpha to fade off gradually, based on color's similarity to selected color. Max tolerance makes full alpha gradient from selected color to it's opposite (for example from full bright to full dark, if brightness from 255 to 255 is selected). Feather control softens edges by blurring alpha channel by selected radius. I recommended to adjust this after all other controls are set, due to heavy impact on processing speed. Base Opacity control adjusts alpha of "non-selected" color. Invert Alpha check box inverts final alpha. Reset button returns to default setting (that is: color range from primary color and other controls zero). Note: greyscale pixels are also treated as color, defined by Hue=0, Saturation=0. you may want to re-download (clean your browser cache before that). or If you can think of a better place? just a thing what about an UI like the Conditional Hue\Saturation? you know with the color wheel to show the range.. 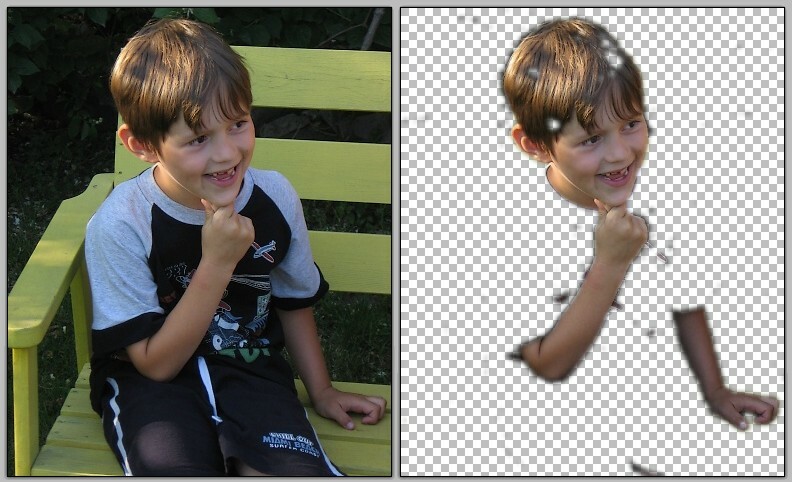 Finally, a way to cut out antialiased images fast*! Wouldn't it be "Color" (without "s")? I don't care where this fine plugin is located, but I don't think it's an adjustment. Tanel, nice update and great improvements from "Tone Picker", glad to see you took my advice and added the "feather" effect to your plug-in . I'm a fan of that color wheel - angle control too, but this is Evan's own creation and I don't want to rip off his code. I tend to agree on Adjustments menu, seems to be more relevant than Effects. I will change it together with other possible fixes in a week or so. I don't think Conditional Hue and Saturation's source was released. But it is still quite over my head. :? Anyway, great plugin on your part, Tanel! That color wheel would be nice, but I can live without it! Please keep the UI as it is, it's very easy to work with and different then Con/Hue/Sat. Seconded. The current UI is rather a + than a -. Personally, I disagree. At first use, trying to figure how to select your desired color range takes way too long. I think Conditional Hue/Sat makes the whole color range selection thing way more discoverable. Once you get past that, this plugin is one of the best plugins ever...just to be clear. I concur. I like Conditional Hue/Sat's UI...like barkbark00 mentioned, good stuff. That being said, it's your plugin and you are free to do whatever you like with it. Beggars can't be choosers...we're just lucky to have it! I'm going to keep current UI at this point. Though I agree it's not easy for beginners. 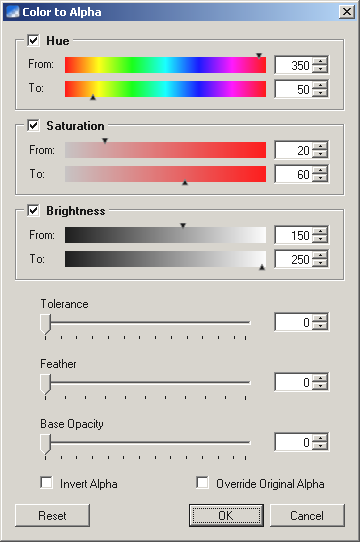 The downside of the Conditional Hue/Sat UI is that you can't select shades (black/white/gray). For that reason I prefer the current UI. Great plugin. I have made few improvements, please upgrade! Download link in 1st post. 1) Effect is now located in Adjustments menu. 2) Fixed a bug caused by PDN's Gaussian Blur misbehaviour. Semitransparent areas are now feathered correctly. - unchecked (default) -> transparent pixels remain transparent, even if pixel's color match your selected color. - checked -> transparent pixels turn opaque if pixel's color match your selected color. This is useful if a layer contains erased areas: you can decide wheter to keep those intact or not. I like the colour wheel but agree with Deborah, so why not mix them? I would rather see the From and To values on the screen at the same time. That way my brain can comprehend the range that I'm working with.